Although Fred’s time with our family began about one year ago, his story began over six years before that. 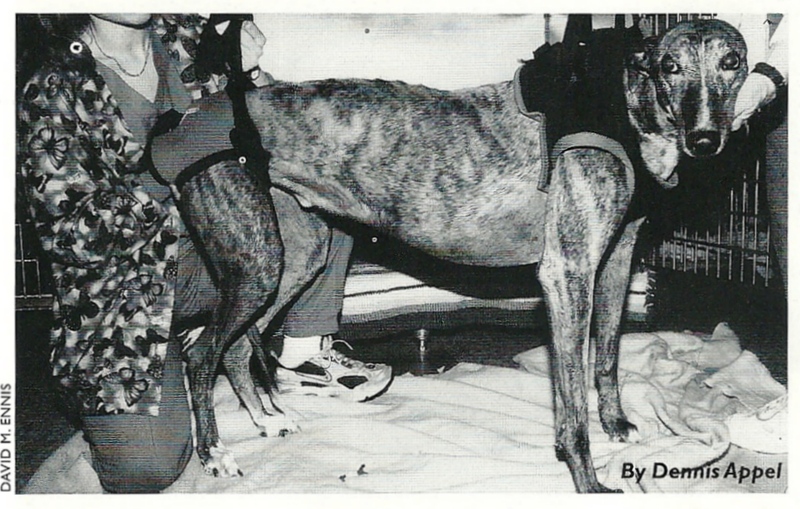 Fred was raised to be a racing Greyhound, not unlike many thousands of Greyhounds each year. His boundless enthusiasm and excitement for the chase more often than not took him to the lead. Fred didn’t know where the finish line was and, as such, did not pace himself. As a result, other Greyhounds would sometimes pass him before this imaginary line was reached. Fred ran fast enough to be a very successful racer. Fred’s overwhelming enthusiasm to try and catch the rabbit was a reflection of the way he approached life and would continue to serve him well. Fred raced until he was two months short of his fifth birthday, a very long time for most Greyhounds. After his racing career was over, Fred came to be a live-in blood donor for Wheat Ridge Animal Hospital in Colorado. Like most other Greyhounds, Fred has a universal blood type that can be used by all other dog breeds. As a live-in blood donor, Fred made many friends with the Wheat Ridge Animal Hospital staff and helped save the lives of other dogs in need. Occasionally, he spent weekends at the staff members’ homes, endearing himself to them. He was a very personable and affectionate soul at home. After five years of training and racing and one year as a blood donor, the time had finally come for Fred to begin his well-earned retirement. My wife Ann asked about the Greyhound whose picture was on a bulletin board. We were picking up our first Greyhound, Belle. She had just completed a blood donation to help her canine relatives. Fred, who incidentally has never met a stranger, immediately said, “Hello, glad to meet you,” in his unique and most sincere way. He rested his head on Belle’s back during this meeting. When I got home from work that afternoon and heard the story of what had happened, I knew that we were going to be adopting another Greyhound. Fred came into our home not long after that initial chance meeting. He very quickly adjusted to retirement. The wonder in his eyes as he discovered the sights, sounds, and smells of the real world was something to behold. You could clearly see the expression that said, “Wow, would you look at that!” as he discovered something new. He gave confidence to our otherwise shy female Greyhound. Fred became a wonderful “Meet and Greet” Greyhound. He would look directly into the eyes of everyone he met with warmth and seeming familiarity. After only eight months of retirement, Fred suffered a cervical stroke (a fibrocartilagenous embolism or FCE) on St. Patrick’s Day. Fred had just completed a spirited midday walk with Ann and Belle, showing his usual intense interest in a nearby prairie dog colony. When he arrived home, he instantly became almost lethargic. His breathing went from rapid to almost nothing. Fred went to lie down on his bed, looking at Ann with a confused expression that somehow conveyed the urgency of the situation. Ann got Fred in the car and started toward Wheat Ridge Animal Hospital. It was sheer luck that Ann was at home at that particular time of day. It was only because we were to leave shortly for California for a surprise birthday party for my father-in-law. By the time Fred and Ann reached Wheat Ridge Animal Hospital, Fred was no longer breathing. The fantastic staff immediately got Fred on a breathing tube. Throughout the whole incident, Fred remained alert and awake. He recognized his name and us. I never saw fear in his eyes, only confusion and frustration. Despite the best efforts of many, Fred could not breathe on his own. Late into the evening the hard facts were presented to us that Fred would not likely recover his ability to breathe on his own again. We decided to give Fred until the morning with the minimal hope that somehow his condition would change. We arrived early the next morning expecting to say goodbye to Fred. Once more they gave him a shot to try to stimulate his body to breathe on his own. They removed his breathing tube and he breathed! This was so startling that one of the veterinarians exclaimed, “Wow!” We were surprised and thrilled, among other emotions. But now what? What had caused this? Would it happen again? Could he recover to live a meaningful life? No one knew the answers. But now suddenly, there was hope. Fred was fighting to take each breath and at the same time trying to stay awake. For hours that day we talked, scratched, and petted him, all the while encouraging him to keep fighting. Occasionally, as his oxygen intake dropped below the necessary level to properly maintain his body, he was given a number of breaths through a breathing bag. Each time, he fell asleep instantly, completely exhausted. Fred had an MRI and it was discovered that a piece of Fred’s neck vertebrae had broken off. This affected his vascular system and shut down his body’s ability to breathe. We were told this is a very rare occurrence and that there was little chance of the same thing reoccurring. The best news was that Fred would likely recover to resume a meaningful life and enjoy retirement. Slowly but surely each day Fred improved. He slowly regained the ability to breathe unassisted. Eventually he could lift his head and then move his front legs ever so slightly. Since almost everyone knew Fred from his previous residency, the good folks at Wheat Ridge Animal Hospital and Dr. Brendan McKiernan, Fred’s primary veterinarian, gave Fred lots of attention and encouragement. Without a doubt, that helped him in his recovery. In a week’s time, we were able to bring Fred home. In several days he would begin physical therapy. There was a lot of excitement that day as we carried Fred in the front door and Belle got a chance to see her buddy for the first time in a week. Immediately she sensed that something was wrong with Fred; you could clearly see it in her eyes. She recognized that he wouldn’t be able to romp with her in the yard and treated him with understanding. Fred sure was glad to be home, but his struggle to recover had only begun. At this point, Fred could only lift his head and move his front legs slightly. He had to be attended to in every other way, around the clock. Over the next three weeks, Fred received physical therapy at the Alameda East Veterinary Hospital, (yes, the Emergency Vets on the Animal Planet cable network). Fred worked hard each day, first in the water, later on a treadmill. Every two hours Fred was made to try to use his legs as best he could. Sometimes in exhaustion he would attempt to crawl back to his cage, but he dutifully did his best. Fred healed from his nose to his tail, and from his left to his right side. Over the next three weeks his strength and coordination returned. At home each morning and evening, Fred attempted using only his front legs to crawl toward the door to go outside. He tried so hard to get there. His disappointment was evident from the sad expression on his face when nature’s call invariably overwhelmed him. He so much wanted to walk, run, and play. In the face of Fred’s daily struggles, we could clearly see some improvement every day. By the time Fred had completed his physical therapy, he could walk again. After going in and out of Alameda East on a stretcher each day, he was able to proudly walk out his last day. Fred could now get around the house and backyard in relatively good shape, although others may have thought that he was a bit tipsy. He tired quickly and was still unsure on his feet, but most importantly, he had the freedom to walk. During the first week of June Fred cleared what was his last major hurdle to recovery. He made it up and down the stairs without assistance for the first time. Each time he completes the trip, he jumps around excitedly as if to say, “Look what I did!” To date, he continues to regain coordination, takes increasing pleasure in play, and attempts to run with me while on a lead. His recovery has been nothing short of remarkable. I firmly believe that Fred’s continued existence in this world is no accident. There were so many critical occurrences, as well as, talented and loving people whose direct involvement were necessary to giving Fred a chance to survive. Fred also received important support from others in the form of good wishes and prayers and our heartfelt thanks to all of them. Additionally, Fred’s own desire to live cannot be underestimated. Under such conditions, many humans would not have fought as hard as Fred did to continue his life. I take inspiration from his effort. Fred has recently resumed his work as an ambassador for Greyhound adoption. Fred still enthusiastically meets everyone with a wag of his tail, a soft expression, and with direct eye contact that conveys the warmth of his soul. Perhaps that is why Fred recovered against all odds—so that he can help those Greyhounds who are still waiting for their opportunity for a soft bed, a toy, and a daily dose of hugs and kisses in retirement.